The first thing you need to do is to come up with your list of contacts. 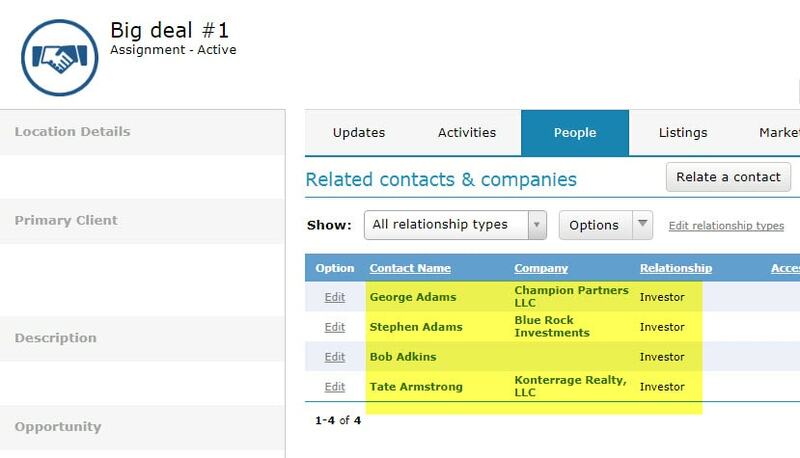 If these people are currently related to an existing deal, then you can ask for a list of those people from the deal record. A box will open allowing you to choose the deal that you would like to relate these contacts to. Type in a few letters of your new deal name and select the deal from the list of matches that pops up. Choose a relationship type and how you want this relationship to be shared with your team (if you are on a shared database) and then click “Relate this deal” to finish the process. In this case, I’m not interested in copying contacts from an existing deal, but I want to search ClientLook for people that meet certain criteria. In the example below, I’m using the “Advanced Search” feature to search a few of the custom fields on my account to find 15,000 to 20,000 square foot office tenants with leases expiring later this year. 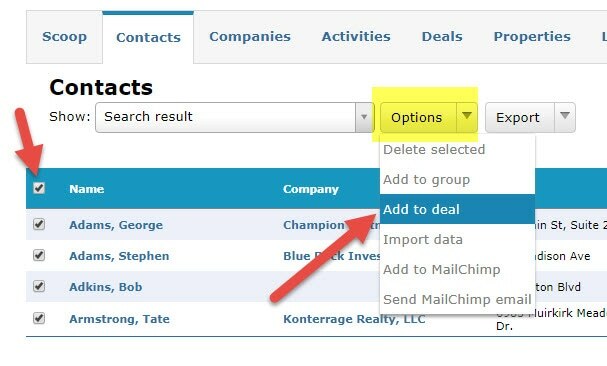 When I click “Search”, I will get a list of contacts that meet this criteria in a list view, exactly like the one illustrated above. Then I can choose to add these people to a deal in the same manner as above. This works for groups as well; choosing an existing contact group will allow me to select all group members and then add them in the same way. Need help with this feature or any other feature in ClientLook? Just click the “big blue button” located in the bottom right corner of any ClientLook page on the web or in the iPhone app to be connected to our support team. We’re always happy to help.